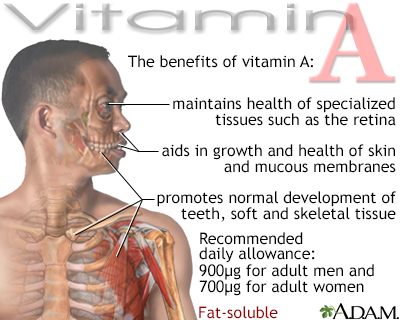 Vitamin A is a fat-soluble vitamin that is stored in the liver. There are two types of vitamin A that are found in the diet. Preformed vitamin A is found in animal products such as meat, fish, poultry, and dairy foods. Provitamin A is found in plant-based foods such as fruits and vegetables. 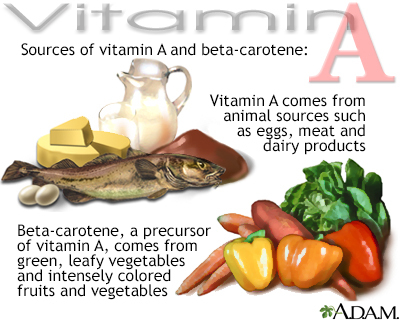 The most common type of pro-vitamin A is beta-carotene. Vitamin A is also available in dietary supplements. It most often comes in the form of retinyl acetate or retinyl palmitate (preformed vitamin A), beta-carotene (provitamin A) or a combination of preformed and provitamin A.
Vitamin A helps form and maintain healthy teeth, skeletal and soft tissue, mucus membranes, and skin. It is also known as retinol because it produces the pigments in the retina of the eye. Vitamin A promotes good vision, especially in low light. It may also be needed for reproduction and breastfeeding. Retinol is an active form of vitamin A. It is found in animal liver, whole milk, and some fortified foods. Vitamin A comes from animal sources, such as eggs, meat, fortified milk, cheese, cream, liver, kidney, cod, and halibut fish oil. However, many of these sources, except for skim milk that has been fortified with Vitamin A, are high in saturated fat and cholesterol. The more intense the color of a fruit or vegetable, the higher the beta-carotene content. Vegetable sources of beta-carotene are fat- and cholesterol-free. The absorption will be improved if these sources are consumed with a fat. If you do not get enough vitamin A, you are at increased risk for eye problems. These include reversible night blindness and then non-reversible corneal damage known as xerophthalmia. Lack of vitamin A can lead to hyperkeratosis or dry, scaly skin. If you get too much vitamin A, you can become sick. Large doses of vitamin A can also cause birth defects. Acute vitamin A poisoning most often occurs when an adult takes several hundred thousand IUs of vitamin A. Symptoms of chronic vitamin A poisoning may occur in adults who regularly take more than 25,000 IU a day. Babies and children are more sensitive to vitamin A, and can become sick after taking smaller doses of vitamin A or vitamin A-containing products such as retinol (found in skin creams). Large amounts of beta-carotene will not make you sick. However, increased amounts of beta-carotene can turn the skin yellow or orange. The skin color will return to normal once you reduce your intake of beta-carotene. The best way to get the daily requirement of essential vitamins is to eat a wide variety of fruits, vegetables, fortified dairy foods, legumes (dried beans), lentils, and whole grains. The Recommended Dietary Allowance (RDA) for vitamins is how much of each vitamin most people should get each day. The RDA for vitamins may be used as goals for each person. How much of each vitamin you need depends on your age and gender. Other factors, such as pregnancy and your health, are also important. Ask your health care provider what dose is best for you. Institute of Medicine, Food and Nutrition Board. Dietary Reference Intakes for Vitamin A, Vitamin K, Arsenic, Boron, Chromium, Copper, Iodine, Iron, Manganese, Molybdenium, Nickel, Silicon, Vanadium, and Zinc. National Academies Press. Washington, DC, 2001. PMID: 25057538 www.ncbi.nlm.nih.gov/pubmed/25057538. Vitamin A, also known as retinol, is essential to the formation of visual purple in the retina, which allows vision in dim light. Beta carotene, the precursor to vitamin A found in vegetables, has antioxidant properties, which means it protects cells from the daily toxic damage of oxidation. Like most vitamins, vitamin A may be obtained in the recommended amount with a well-balanced diet, including some enriched or fortified foods. Reviewed By: Emily Wax, RD, The Brooklyn Hospital Center, Brooklyn, NY. Also reviewed by David Zieve, MD, MHA, Medical Director, Brenda Conaway, Editorial Director, and the A.D.A.M. Editorial team.